A crankshaft angle sensor is designed to detect the rotation of the crankshaft while the engine is running and is responsible for triggering the fuel injection and ignition system via the main PCM computer. 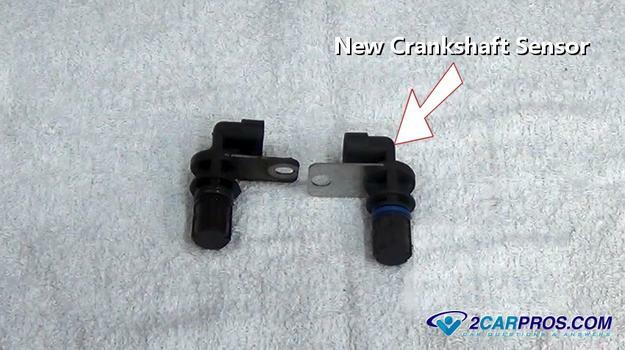 This crank sensor will be located at the lower section of the block and can either be at the front, rear or middle of the engine at the crankshaft level. 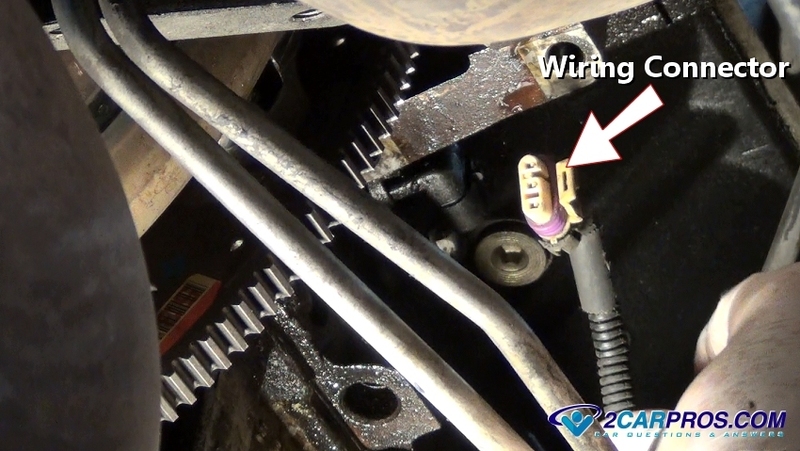 Due to engine vibration, heat and the constant generation of electromagnetic energy being produced internal windings can become brittle and break causing a direct or intermitted short circuit of the sensor which will cause the engine to stall. This failure may or may not cause the check engine light to come on and set a trouble code for this problem. 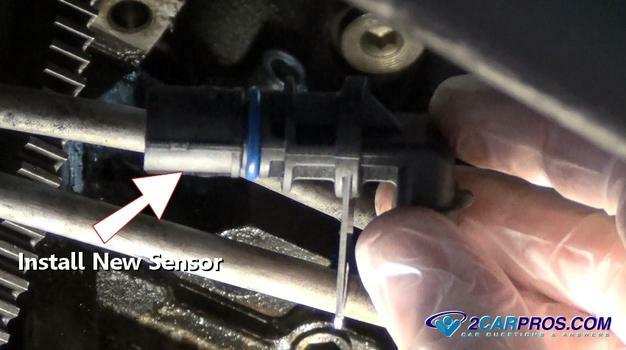 When taking your car into a garage to have the crankshaft position sensor replaced it will vary due to make, model and location of the sensor. Some sensors are out in the open while other can be buried under the starter or in a difficult place to access like the top of the transmission bell housing. The sensor itself will cost between $8.00 and $49.00 (US) on Amazon. Labor will run between $60.00 and $180.00 depending on the location of the sensor. Start by locating the sensor which can be done by inspecting the engine at looking for any sensor at the lower level that matches the new sensor you have just purchased. Also you can check Google images or use a online repair manual service like Mitchell1. You will also need to jack the car up and support it on jack stands. Wear protective gloves and eyewear. There is a video and the bottom of this article showing the job being done. Anytime you are working with the inner workings of the engine its a good idea to disconnect the battery to avoid a short circuit to the car's electrical system. 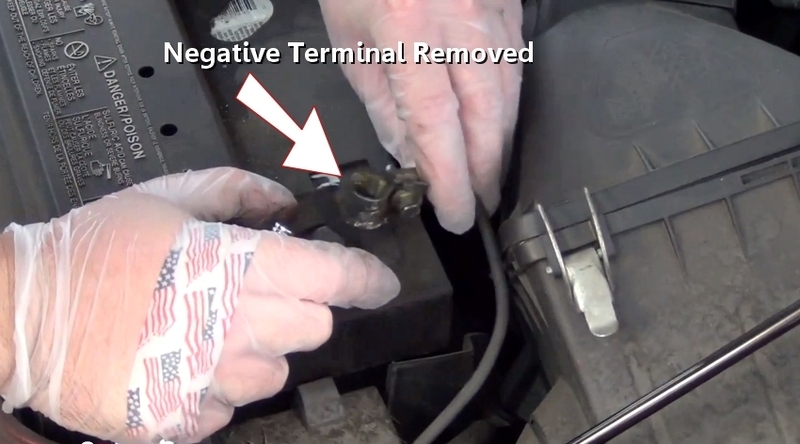 For hybrid vehicles also remove the disarm plug for the main battery pack. Check your owner's manual for the location. 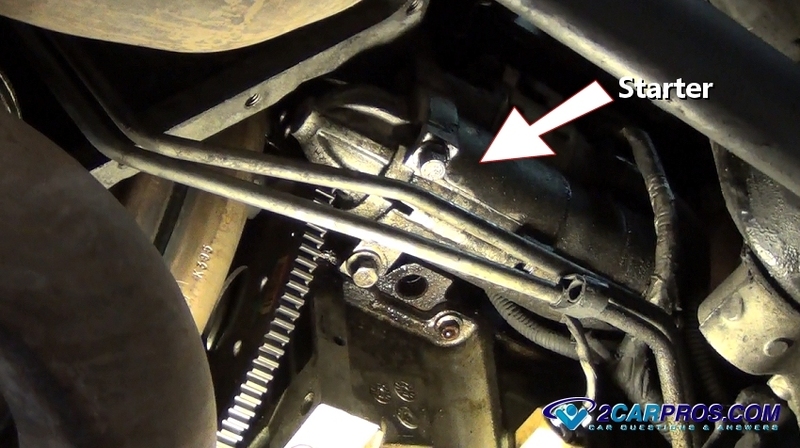 This particular crank sensor is behind the starter motor which must be removed to gain access to the sensor. Use a shop light to help see what you are doing when working under the car. 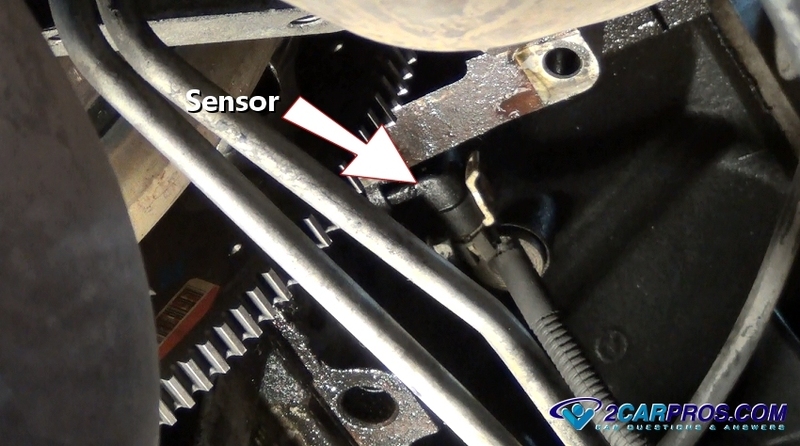 This sensor is a little tough to see because of the transmission cooling lines but is it in the side of the block with the electrical connector attached. 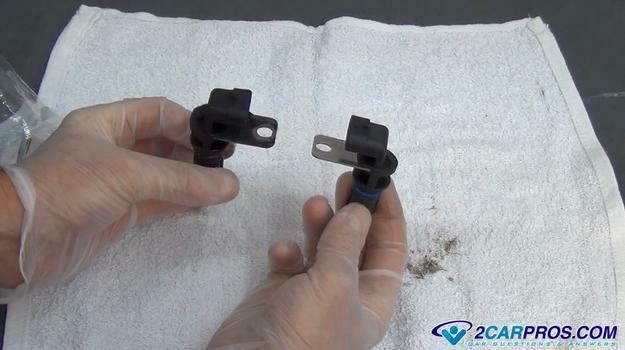 If the crankshaft angle sensor is oily now is a good time to use a small amount of carburetor cleaner to remove the oil to get a clean start on the job. An electrical connector will be held to the sensor using a plastic clip which you much push down or pull outward to release. Once this is done gentle wiggle the connector loose from the sensor. Sometimes this connector can be a little stuck due to the weather pack seal which helps keep water out which will cause corrosion at the sensor terminals. Once the connector is removed check it for rust and clean or replace the pigtail if needed. This problem alone will cause the engine to stall. 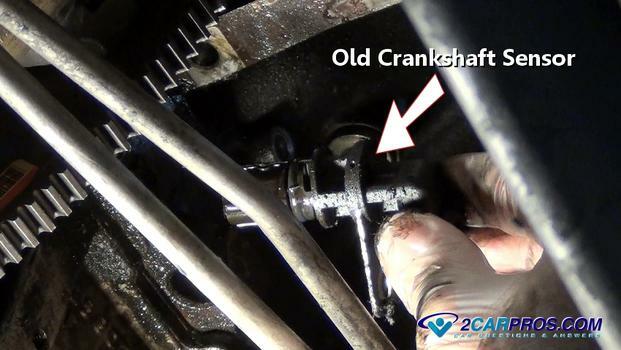 Most crankshaft sensors will have just one mount bolt which will typically be a 10mm bolt. Use a small wrench or socket to remove the bolt by turning it counterclockwise and place to the side for safe keeping. Removing the crank sensor can be a little difficult because they have a long stem and can get stuck in the block. 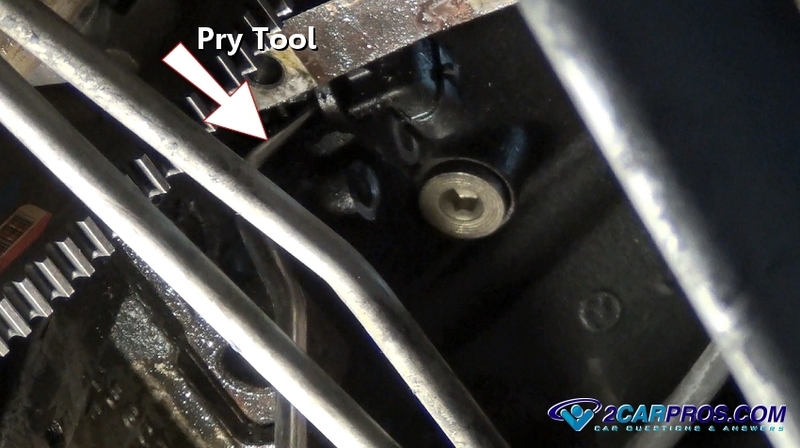 Use a small pick or standard screwdriver to wedge under the sensor mounting tab to pry it loose. 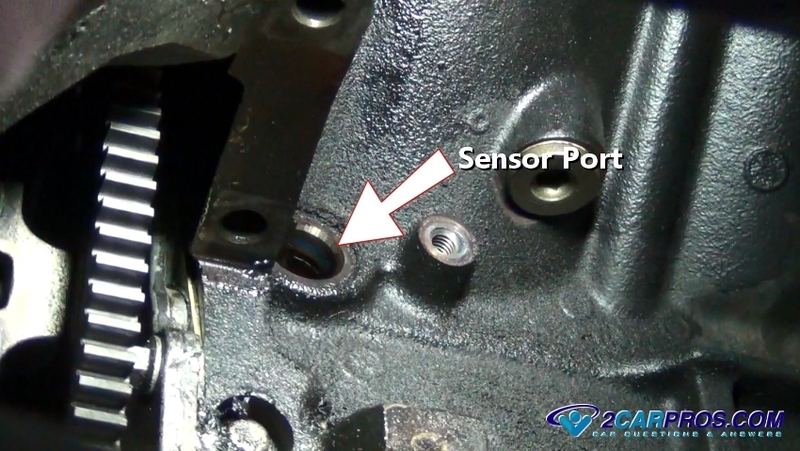 Be careful not to apply to much pressure because these sensors have been known to break leaving a part of the sensor inside the block. When this happens sometimes you will have the option of pushing the broken piece inward so it falls into the oil pan where it will stay or you can remove the oil pan to remove the broken piece. 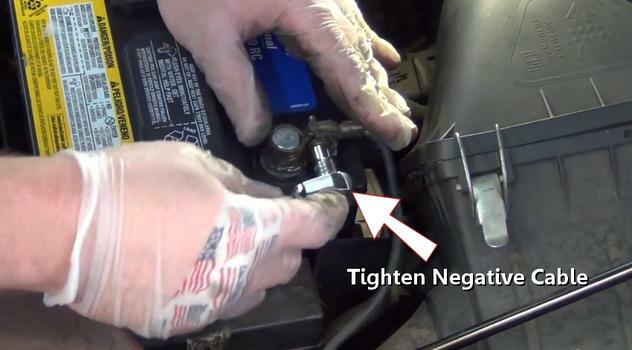 Once the sensor is loose firmly grasp it and with a twisting motion pull it from the engine block. There will be a sealing O ring on the sensor with will need to be replaced with the new sensor. Most new sensors come with a new O ring. Wipe off any oil the old sensor has on it so you can clearly see any design changes the new sensor might have. 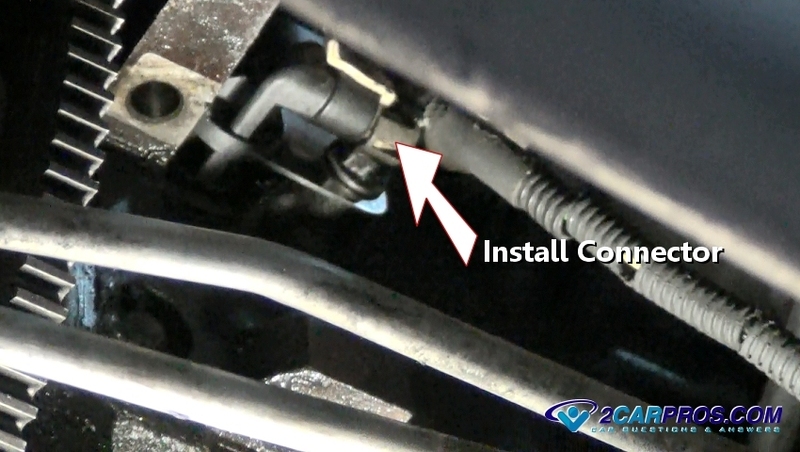 Slight design changes are common when installing new sensors such as mounting tabs. One thing that can be different is the length of the sensor stem because if the stem is too long it will contact the crankshaft and if it is too short it will not read correctly. Before installing the new sensor use a shop towel to clean the position sensor port hole to ensure a proper seal to the new sensor O ring. Motor oil will be present at this port so do not spray carburetor cleaner inside the port. You can spray cleaner on the shop towel to aid the cleaning process. 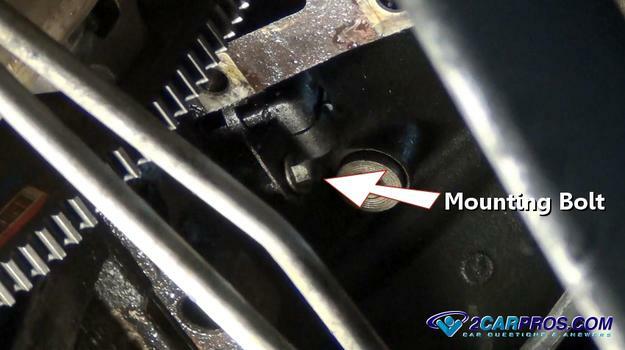 Position the new crank sensor squarely into the sensor port hole and firmly push it into place while aligning the mounting plate hole to the threaded bolt hole in the block. Then insert the mounting bolt and thread it in by hand by turning it clockwise to avoid cross threading. Use a small amount of clean engine oil or WD40 to lubricate the O ring seal to avoid damage to the seal which will cause an oil leak. After the sensor has been installed thread the mounting bolt into place and tighten to about 2-3 foot pounds. Push the electrical connector into place while listening for a click telling you the connector is successfully installed and ready for operation. Now that the job is complete remove the car off of the jack stands and reconnect negative battery cable and you are all set. Watch the video below! Please watch the following video to get an idea how the job is done by one of our mechanics. 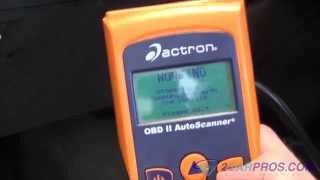 Here is a video of the job being done with the sensor at the rear of the engine.